These were regular thin cut Potato Chips. They had a fairly standard crispy, snappy bite to them. The broken oil bubbles and greasy seasoned surface made them a little easy to munch, without very much noise. These Chips were a kind of scary bright orange color. The Chips were of a standard size, shape and thickness, but the seasoning was really loud and remained on fingers. A Fore-Thumb Test saw a scrape of oily orange powder that we wouldn't advise licking too quickly. 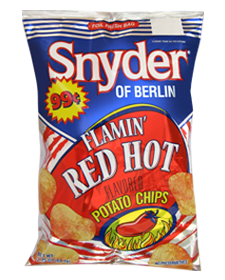 Snyder of Berlin have a wide array of Barbecue related varieties. To market a Flamin' Hot flavor among those would suggest a super hot Chip. There was a peppery, sweet aroma and this was followed by a somewhat tangy Hot Sauce Chip. They were nice and consistent, but the question is - should a Hot Sauce Chip be nice?